Next month sees the start of a process that could change all our lives. Whether we live in Europe, or outside it, the political decisions about to be made have the potential to impact every country in the world – for better or worse. And yet, nobody has yet begun to put together the various pieces of the jigsaw, and identify the wide range of different outcomes that could emerge. By the end of the year, the EU and the eurozone might have collapsed – with massive impact around the world. Or ‘business as usual’ might continue. Or we might have a revived French-German partnership again, reigniting the energy that first began to rebuild Europe after World War 2. None of us know, and it is very dangerous to keep pretending that ‘business as usual’ is the only option. The changes are so vast, and so different in their potential outcomes, that I will explore them in two separate posts this week. Today, I will look at Brexit and the current outlook for the Dutch and French elections. On Thursday, I will look at the outlook in Italy and Germany, and draw some conclusions about what may happen.  Brexit is the first unknown. The UK expects to start the process of leaving the European Union (EU) next month. Premier Theresa May has now published the government’s position on the talks. But what will happen when she presents her terms in Brussels? 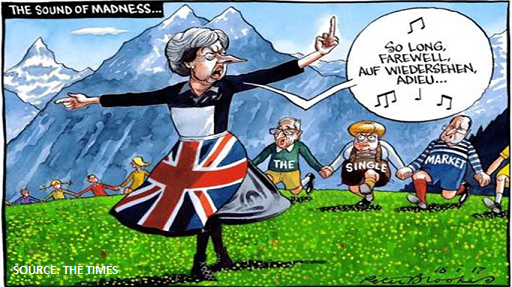 She wants to retain access to the Single Market for critical UK industries such as financial services, autos, aerospace and chemicals – but she doesn’t want to allow immigration to continue on the current basis, and she probably doesn’t want to pay the €60bn bill that Brussels believes she will owe on leaving. So what will happen? Will it be sweetness and light, with everyone singing “For she’s a jolly good fellow” as she walks out the door? Or will there be furious arguments, and no agreements for UK trade in the post-Brexit world? And what will happen back in the UK while all this takes place? Will businesses simply sit back? Or will some decide it would be prudent to move to France, Germany, Ireland or elsewhere? And what might happen in Parliament, where May only has a majority of 12, if things go badly? Could her term as premier end up being one of the shortest on record?  The Dutch elections are the next unknown on 15 March. Geert Wilders, the anti-immigration, anti-EU candidate for premier, is currently leading in the polls. But will he do better, or worse, when the time comes to actually vote? As we know from the Brexit and US Presidential elections, the polls are not always accurate – if people who have not voted in the past, now decide it is time they went to the polling station. And if Wilders does win, will he be able to form a government? Current premier, Mark Rutte, has said he will refuse to work with him. So it could be a very lengthy process before The Netherlands has a new and stable government. And what would happen if Wilders did become premier? His main policy is leaving the EU. On what terms would he seek to do this – would he adopt the same positions as Theresa May, or would he have different priorities? And would the EU itself survive the departure of one of its original 6 members? Many people think it wouldn’t.  France’s presidential elections are next, on 23 April. French polls were completely wrong in the primaries – Alain Juppé was defeated by Francois Fillon for the Republican nomination, Manuel Valls was defeated by Benoît Hamon for the Socialist nomination. At the moment, Emmanuel Macron with his new En Marche! movement, and Marine Le Pen of the National Front, seem likely to go through to the final round. Their outsider status is critical to their appeal, but their policies couldn’t be more different. Macron wants to revive the EU, le Pen wants to leave it. What would happen if Le Pen wins? Almost certainly, the EU would collapse – whether or not Wilders had already begun the process. And what would that mean for the European and global economies? What would happen to the value of the euro? What would happen to the euro itself? Would all the break-up decisions be taken rationally, or would they happen late at night, after bitter argument? What about the alternative, a win for Macron – who only declared his candidacy in November, and is still forming his new party? He has recognised that the curo cannot survive in its current structure, and has argued the EU should develop “a roadmap for Europe” in critical areas including defence, security and the economy. If fellow social democrat, Martin Schulz, were to be elected Chancellor in Germany in October, the stage could be set for a dramatic reshaping of EU policy – and probably also its membership. The contrast with Ms le Pen’s plans couldn’t be stronger. These uncertainties would be difficult enough to manage on their own. Brexit itself is a complete unknown, effectively tearing up the last 43 years of UK law and economic policy. But it could easily be over-shadowed by developments in The Netherlands and France. If either or both decide to leave the EU, who really knows what would happen to the European and global economy, the value of European currencies, or Europe’s relationships with the rest of the world? But these uncertainties are only part of the Great Unknowns now ahead of us. On Thursday, I will look at the highly uncertain political outlook in Italy and Germany. I will also highlight the very different possible outcomes from Europe’s plunge into the Great Unknown – which has the potential to impact all of us, whether we live in Europe or elsewhere. Who would pay the bill, if Greece defaulted on its current €320bn debt ($340bn)? The 2012 deal also involved one very critical element. The debt had been lent by German and other banks, who clearly couldn’t afford to ‘pretend and extend’ the loans. So governments, led by the European Central Bank, repaid these loans and effectively took responsibility for Greece’s debt. Thus around 75% of Greece’s debt is now owed to governments – only €34bn is now owed to private lenders. This, of course, is the reason why Greece’s unemployment rate is still at 25% – very little ‘new money’ has actually gone into support for the Greek economy itself. In turn, this is why the left-wing Syriza government won power in January. No country is going to put up with 50% of its young people being unemployed forever. And Syriza’s stance on the debt issue is also far more aggressive, tabling a €279bn reparations bill to Germany for a forced loan taken during World War 2. So now the question arises – what would happen if Greece and the Troika (IMF, ECB, EU) fail to agree on another ‘pretend and extend’ default deal? The answer seems clear – the ECB countries would have to pick up the bill. This is where the chart above begins to matter, as it shows the ownership of the ECB itself, based on official ECB data. Germany has the largest share at 18%, and so it would face the biggest bill, which could reach €86bn on some calculations, given related losses which would likely occur in the ECB’s Target 2 payments system. This figure has not been mentioned to the German electorate. Nor have they been told that the bill might well be higher if countries such as Italy (12%) and Spain (9%) decided they couldn’t afford to pay their share. This seems highly likely, given the poor financial state of both economies. A bill for €322bn, or even €86bn, would create a political firestorm in Germany. Electorates in other northern EU states would also be shocked by what had been done in their name. It would also probably create a major political crisis in non-Eurozone members such as the UK, which owns 14% of the ECB’s capital. Of course, the EU may still come up with another version of the ‘pretend and extend’ policy. Experienced observers such as Commerzbank suggest there is at least a 50% chance of this happening. But positions are clearly hardening on both sides. In turn, the fault lines around the global debt-fuelled ‘Ring of Fire’ could well widen still further, if reality overtakes the ‘pretend and extend’ policy. On 7 September 2008, in its now famous warning that a financial crisis was imminent, the blog noted that “‘Deleveraging’ is an ugly word, and it has ugly implications“. The chart above shows just how ugly these implications are becoming for the PIIGS countries (Portugal, Italy, Ireland, Greece, Spain). Overall, $1.04tn has been withdrawn, a 39% reduction since December 2009. This is equal to 23% of the PIIGS’ combined GDP. These numbers, of course, explain why the European Central Bank (ECB) made its emergency €1tn ($1.4tn) loans at the end of December. It says it was seriously concerned “a dangerous loop involving low economic activity, funding stress for banks and a reduction in lending” might occur. This is central bank-speak for saying that the European banking system might well have collapsed. But the ECB’s lending under the Long Term Refinancing Obligation was just that, lending. It dealt with the immediate cash-flow problem in December. But it did not deal with the solvency issue. Many of these loans will never be repaid, as the assets behind them are now worthless. Pensions were one of the great inventions of the past century. Now the European Central Bank (ECB) has issued a ‘wake-up call’ on the affordability issues that lie ahead. Since then, we have failed to index pension age to rising life expectancy. In addition, Westerners have come to assume that pensions are a ‘universal right’. We forget that younger people will have to pay the bill for this dramatic increase in costs. The ECB is not supposed to intervene in political issues. So it cannot publically state the obvious conclusion. But most people reading the report will be in no doubt about what this means. Put simply, future pensioners are most unlikely to actually receive the money that has been ‘promised’ to them. Younger generations cannot, and will not, afford to pay the bill. In turn, this has enormous implications for the type and cost of the products and services that older people will require. Affordability will be the key criteria for them in future years, not ‘value in use’. Companies that grasp this challenge will not only help to cushion the transition for disappointed would-be pensioners. They will also build a robust platform for their own future growth. It is clearly far too early to assume that EU leaders have really decided to take the difficult decisons necessary to restore long-term financial health. The key issue remains Italy, where major doubts remain over the government’s willingness, as well as ability, to make the major cuts necessary to reduce its borrowing to manageable levels. Unsurprisingly, international lending to Greek banks has dropped quite sharply over the past 12 months, according to latest data from the BIS (Bank for International Settlements). As the chart shows, it was $111bn at the end of June, compared to $174bn in June 2010, and $182bn in December 2009, when the blog first discussed the problem. Greece of course continues to borrow the same amounts. Instead, it now borrows from the European Central Bank. This means Eurozone taxpayers are standing directly behind the loans, rather than indirectly when the loans were made by the big commercial banks. The politicians’ habit of ‘kicking the can down the road’ is not solving the key issues. Rather, it is increasing the overall economic cost, and the political risk associated with this. Meanwhile, European commercial bank loans to the 2 major economies under pressure – Italy and Spain – were $1388bn. This is lower than December 2009’s $1753bn, but an increase since December 2010’s $1326bn. This perhaps explains investors’ underlying nervousness about what happens when the politicians finally have to confront reality. TUESDAY UPDATE. Greece’s decision to hold a referendum on its austerity plan highlights the fragility of the political consensus behind the current eurozone plans.